This is the story of the Mighty Samson. There was a couple who lived in Zorah, Manoah and his wife. His wife was infertile and unable to give birth. But an angel of the Lord went down and explained to her that she would have a child. The angel also announced the child would save Israel from the Philistines, and gave them specific instructions on how to raise and care for the child, including a special preservation of his hair, that no razor should touch his head. This child would be a Nazarite from birth. Manoah’s wife gave birth to a baby boy whom she named Samson. The child grew and he was blessed by the Lord. One day, the Mighty Samson went down to Timnah and saw a Philistine woman whom he wished to marry. He went to his parents and asked them to arrange for her to be his wife. His parents were not happy, believing he could find a wife from their own people, not knowing it was God’s will to have an opportunity to fight the Philistines. Despite these reservations they went down to Timnah to meet the woman. On their way to the place of the woman Samson would marry, they encountered a lion, which Samson killed with his bare hands. After some time had passed, the Mighty Samson returned to Timnah and noticed that bees had made their home in the carcass of the lion eventually producing honey, which he ate. He took some for his parents, but kept where he got it a secret. Samson and his parents got to their destination and they enjoyed a feast, a custom for young males to do at that time. Thirty male friends were brought to attend the feast and he gave them a riddle, to which the answer was lion and honey. They were asked to solve the riddle within the seven days of the feast. But they were stomped. The men convinced his wife with threats to get the Mighty Samson to tell her the answer to the riddle, so she could tell them. Samson’s wife went to him, with tears in her eyes, and asked him for the answer. He refused until the last day of the feast when he relented. She gave the answer to the men. Now Samson had promised that if the men got the answer right, he would reward them with sheets and a change of garments. To fulfill his promise, Samson went out and killed thirty men in Ashkelom and gave the garments to the men who had answered the riddle correctly. When the Mighty Samson returned to get his wife, her father had given her to one of the men thinking Samson hated her for how she had tricked him. Samson was filled with rage and wreaked havoc on the Philistines. 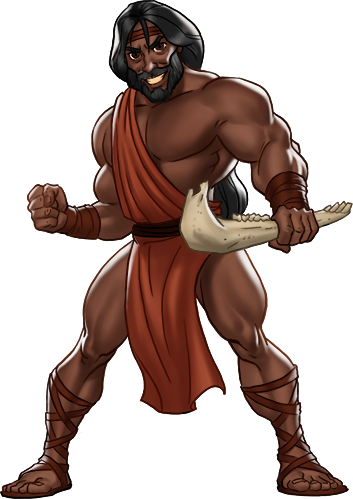 Samson had many episodes with the Philistines, one in particular is where he used the jawbone of a donkey to kill one thousand men. But the Mighty Samson had a weakness for women. He again fell in love with a Philistine woman named Delilah. She was used by her people to find out the secret of Samson’s strength. Delilah asked Samson three times, and three times he lied to her. The first time he told her that weaving the seven braids of his hair to the loom would make his strength leave him. But finally Delilah’s persistence resulted in success when Samson confessed he was a Nazarite and if his head was shaven, he would lose his strength. Delilah took advantage of this and when Samson slept, she cut the Mighty Samson’s hair making it easy for the Philistines to subdue him. The Mighty Samson was taken to Gaza where they took his eyes out and forced him to grind in prison. After some time, the lords of the Philistines gathered to offer sacrifice to their god, Dagon, as gratitude for delivering Samson into their hands. The Philistines rejoiced at seeing Samson bound and in prison. Now at this time, Samson’s hair was growing back and his strength was returning. But the Philistines were enjoying themselves immensely and decided to use him for their amusement. Samson was placed between two pillars and he asked the boy who led him, to allow him to feel the pillars on both sides. The Mighty Samson prayed fervently to God, asking Him to restore his strength. God listened and gave him what he asked for. And with a final burst of strength, Samson pushed against the two pillars bringing down the whole building, killing himself and all of those inside, more people than Samson had killed in his entire lifetime.